Guests of Dans Florida Condos (www.dansfloridacondos.com), on Anna Maria Island can leave the pots and pans at home while vacationing. 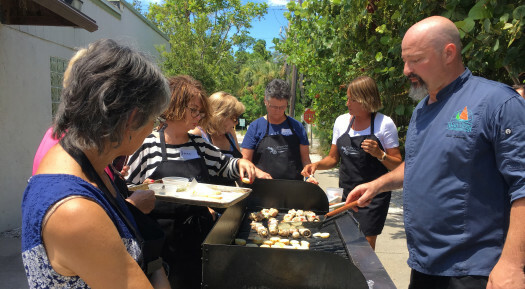 Not only do our units include a full kitchen will everything you need to make a scrambled egg to Thanksgiving dinner, the more adventurous traveler can now take cooking classes while visiting Anna Maria Island! Cooking Classes are back at the Studio at Gulf and Pine! Learn new recipes and culinary techniques from the Master Chefs of the Sandbar, Beach House and Mar Vista Restaurants. These hands on cooking lessons will feature a variety of locally sourced ingredients showcasing fresh, summer flavors and sustainable menu items. 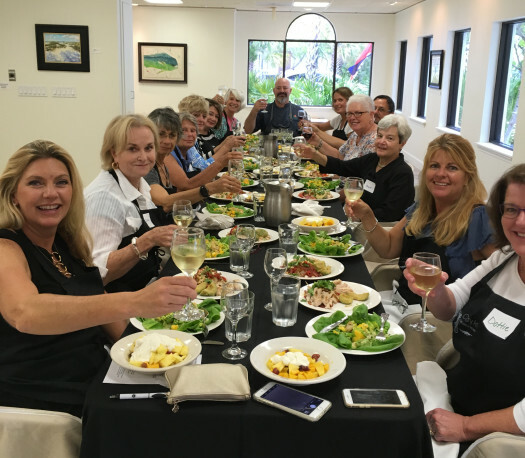 In the relaxed and beautiful setting of the Studio art gallery you will enjoy learning how to make dishes that will be sure to impress your guests at your next dinner party or special occasion. Join Sandbar Executive Chef Rich Demarse, Beach House Executive Chef Will Manson, Mar Vista Executive Chef Erik Walker and Sous Chef Toffer Jacobs for fun, interactive, chef-led cooking classes on a variety of topics – each class features a unique culinary theme. Classes will be held Thursdays, June 7th – August 2nd, 11:00am -2:00ish. Class fee is $99 per person per class (includes tax and gratuity, an apron, recipes, cooking lesson, lunch, plus a few surprises). Sign up for all nine and only pay for 8. Class size is limited to 16 so hurry to reserve your spot today. To make your purchase and reserve your seat at the table or for more information contact Caryn Hodge at 941-713-3105 or chodge@chilesgroup.com or book directly at www.studioatgulfandpine.com/culinaryart. Seating is limited and the classes fill up quickly so book your spot today. The Studio at Gulf and Pine is located at 10101 Gulf Drive, Anna Maria, FL. Free parking. • June 7 – Stocks and Sauces with Chef Rich Demarse. Chef Rich will teach you the basics and some tricks of the trade of making a stock along with some delicious, versatile sauces. • June 14 – Sushi! It’s all about the roll! Chef Rich Demarse will show you some innovative ways to make this ancient style of cuisine. • June 21 – Eggs, Eggs, Eggs! with Chef Erik Walker will surprise you with all the ways you can use eggs in delicious ways you can create one of a kind dishes using farm fresh eggs. • June 28 – The Summer Grill with Chef Erik Walker. Re-discover a summer pastime, grilling! We will discuss grilling techniques for different proteins, which charcoals use, as well as gas vs. charcoal grilling. • July 5 – Fish and Poultry with Chef Erik Walker. Learn everything you need to know about fileting and deboning fish and poultry, while discovering new and exciting ways to incorporate these proteins into your recipe repertoire. • July 12 – Comfort Food Favorites with Chef Will Manson. There’s no place like home! Chef Will shows you how to put some new twists on some old classics. • July 19 – Ala Minute with Sous Chef Toffer Jacob. Discover French style cooking using local ingredients from the farm to the sea. • July 26 – Let’s Party! with Chef Will Manson. Learn how to be the hostess with the mostest. Give a dinner party and actually be able to enjoy it with your guests. Our friendly mixologist will be mixing fun cocktails too! • Aug 2 – Vegan Dinner with Chef Rich Demarse. More veggies please! Discover new ways to make farm fresh vegetables interesting and delicious. without the written consent of Dans Florida Condos.